Breastfeeding and Breast Cancer- How Are They Related? You are here: Home / Women's Health / Breastfeeding and Breast Cancer – How Are They Related? You may have heard that there is some connection between breastfeeding and breast cancer but are not quite sure how the two are related. It has long been known that breastfeeding reduces the risk of breast cancer almost by half – that’s a huge reduction. 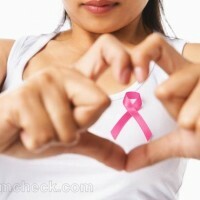 It is also speculated that you can reduce a baby girl’s breast cancer risk if you choose to breast feed her. Let’s take a closer look at these theories. If you are breastfeeding, then it obviously means that you were pregnant before that. During pregnancy and while you breastfeed, you do not get your period. What does that have to do with breast cancer? Well, over 78% of all cases of breast cancer are fuelled by estrogen, a hormone that occurs naturally in the body at high levels if you have regular menstrual cycles. When menstruation stops as a result of pregnancy and breastfeeding, it results in lower levels of estrogen production. This in turn reduces your overall exposure to the hormone, thus considerably reducing your risk of breast cancer. You reduce your risk further with each consecutive successful pregnancy (about 7% every time) and the longer you breastfeed your baby. Another theory – although keep in mind this is still being researched – is that when you breastfeed, the cells in your breast undergo a change which somehow makes them more resistant to the development of cancer. Why this is so, what exactly it is that causes the changes and what the changes themselves are have yet to be uncovered. Carcinogens are substances that are known to have the potential to cause cancer in healthy cells. Unfortunately for us, the modern world has several carcinogens just roaming free in the environment as well as in some goods and products that we use on a regular basis. Not all carcinogens are known so you cannot always protect yourself from them. These carcinogens store themselves in fat cells in the body. Breasts are made up largely of fat so the carcinogens can stay there undetected for years. However, while you are lactating, carcinogens are somehow unable to store themselves in the fat cells of the breast. This means that new carcinogens will find it harder to infiltrate healthy tissue while older ones may not be able to be effectively stored anymore. Can you protect your baby girl too? There is no definite conclusion on this one yet but the prognosis looks good. Apparently, breastfeeding your baby girl will reduce her risk of breast cancer in the future. The longer you breastfeed, the more you may reduce her risk not just of cancer but of other diseases as well. Although these are all very encouraging theories, remember that they are still in the hypothesis stage of investigation. Also keep in mind that there have been cases of breast cancer where the women had several children and breastfed them all. So breastfeeding is not guaranteed to protect you from breast cancer even though it is supposedly the most effective one. It would thus be prudent to take all other precautions possible to keep the killer disease at bay.